You can buy pizzas and ice creams named after him, sand from the track where he overtook a famous rival, and his home town has become a tourist destination. MotoGP rider Valentino Rossi might be a nine-time world champion, but he hasn't won a title in almost a decade. With the 40-year-old Italian competing in his 24th season at World Championship level, there is no sign of the cult of Rossi fading. Here are six reasons why 'The Doctor' remains the icon of his sport. Rossi's record is brilliant - he is still the only rider in history to win World Championships in 125cc, 250cc, 500cc and MotoGP. He was prolific in his first nine seasons at MotoGP level - between 2002 and 2010 - winning six championships, including four in a row between 2002-2005. He finished third last season. Flavio Fratesi, director of the official Rossi fan club, said: "Even after winning everything and after many years, Valentino still trains and runs with the same passion and energy that he had in the beginning. "Despite not winning so much in recent years, people love him and follow him even more, because he has now become a fundamental symbol for this sport." And even after terrible injuries he has not given up. Most notably, he raced in the 2017 Aragon GP just 21 days after suffering a double leg break, and despite needing a stick to walk. He finished fifth. Rossi may not have won a single race in 2018, but still finished third overall - competing against riders nearly half his age. Many say he is one of the best GP racers of all time, on a par with Giacomo Agostini and Mick Doohan, especially with those nine titles and his record 89 races wins in the MotoGP class. "Tavullia is seen as a place of pilgrimage by many fans. Some have even come here during their honeymoon," says Fratesi. "When they come, they come to see the places where Valentino grew up, where he lives and where he trains." Rossi's official fan club has more than 18,000 members from 88 countries around the world - his Facebook page has 13 million likes - the same as the official MotoGP Facebook page. More than 20,000 visit his home town each year - from Europe, Asia and South America. VR46 flags fly all year round in the town, and during the Misano GP race weekend in San Marino, the speed limit is changed to 46kph in a nod to his race number. There is a Rossi store selling his merchandise, his official fan club, a restaurant and pizzeria bearing his name, as well as a Rossi bar and ice cream shop. "Many fans take pictures of the symbolic places of Tavullia and above all come to join the fan club and eat at the restaurant," adds Fratesi. "If you visit his shop the craziest thing to buy is some sand taken from the famous Laguna Seca corkscrew, after his legendary overtake on Casey Stoner in 2008." Bradley Smith has been competing against Rossi in MotoGP for five years. "I think it's quite surreal being on a track with him because he is 40 and we are talking about a guy who won his first Grand Prix when I was six," said the Briton. "The first year I really watched MotoGP was when he won his race in 2004 in South Africa. Since I have been watching, he has always been there. "It's the second or third generation that have come since him so the level keeps on getting higher and higher and he still stands his ground - which is impressive." The main man taking that level higher is defending champion Marc Marquez, who was only three when Rossi won his first GP in 1996. Twenty three years later and Marquez is a seven-time title winner and the sport's dominant force. Scottish Moto3 rider John McPhee has been in the MotoGP paddock since 2012. "Every single year he has been a championship contender and that is something that some riders never, ever manage to have," he said. "Rossi had to change his riding style a lot to adapt to the new technology of the bikes and he has managed to do that and is still competitive." He transcends motorsport, and fellow sporting superstars hold him in high esteem. On Rossi's 40th birthday, Formula 1 world champion Lewis Hamilton, tennis greats Roger Federer and Rafa Nadal, and football legend Diego Maradona all sent video messages. And Hamilton asked Rossi on social media if he could train with him. Fans love a rivalry, and Rossi has had plenty of foes throughout the years. He may be an icon to a younger generation of riders but if you are fighting with him for a title, he could become your worst enemy. Max Biaggi and Rossi clashed in 2001 at the opening round in Suzuka, and in Catalunya the same year they had an altercation on the steps leading up to the podium. Both denied throwing punches but Biaggi later appeared with scratches on his face, which he said at the time must have been caused by a mosquito. In 2004, Rossi's spat with Sete Gibernau came to the fore in Qatar. Rossi was relegated to the back of the grid following complaints from Gibernau's Gresini Honda team. A year later they came together at the final corner in Jerez, with Gibernau complaining about Rossi's aggressive riding style. Another rider who has been critical of Rossi is two-time champion Casey Stoner. In 2008 the pair had a close call at Laguna Seca after Rossi made a move on the corkscrew section of the track. Stoner crashed, Rossi won the race and eventually the title. A token from that moment is treasured by his supporters - hence the sand on sale at the Rossi gift shop. In 2009, Rossi had Yamaha team-mate Jorge Lorenzo to contend with. Both were fighting for the championship, and the Catalunya GP ended with a last-corner showdown. Rossi made his move and took the win by less than a tenth of a second on his way to his ninth - and last - championship to date. Rossi and Marquez have not had the best relationship either. In 2015, Rossi was penalised for appearing to kick Marquez off his bike at the Malaysian GP. Rossi has always maintained Marquez's handlebar touched his leg and his foot came off the peg. 'The Doctor' has never been shy when it comes to on or off-track activities. "He has a lot of success thanks to his personality, his charisma and his passion for what he does," says Fratesi. And when it came to celebrations, Rossi was the trail-blazer, always thinking of new ways to revel in his success. He has worn a Robin Hood outfit on the podium, pretended he was in charge of a chain gang and even run to a Portaloo on a slow-down lap. Rossi was one of the first riders to really involve the crowd at race meetings, and that has helped his fanbase grow. "To see the reception week in, week out no matter how good or bad his season is going... the amount of yellow VR46 flags around the event is massive," said MotoGP wildcard rider Bradley Smith. "The following he has all around the world, he has captured the imagination of a lot of people and someone like that has done a lot for the sport,"
Rossi runs race teams in the Moto2 and Moto3 support classes. 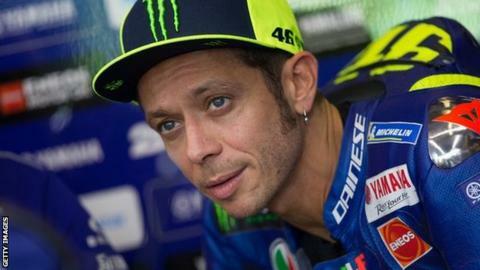 His VR46 ranch in his home town is a 'back-to-basics' base for his academy, with a 1.5-mile dirt track where Rossi likes to test himself against up-and-coming riders. "The ranch wasn't what I expected," said McPhee. "He has a barn at the edge of his local town and it is on a big piece of farmland. "For meals they generally have barbeques, for drinks they have a coffee machine and water. It's not a luxury place - it is kind of what racing used to be, it is purely about the bikes. "He has an interest in the Moto3 riders and bringing them on. He is always keeping himself sharp and on his toes and being in his best shape possible." Whether that will be enough for that elusive 10th title remains to be seen. His Yamaha contract runs out at the end of the 2020 season, when he will be 41. The oldest rider to win a GP race was 44, so he may not be done yet. And, no doubt, his dedicated fans will follow him until the end.